Miss Danika Florentino 18th Birthday in ClearWater Resort Pampanga!! Clearwater Resort Clark Pampanga is not only well known for being one of the most sought after venue for teambuildings and corporate outings. The resort also provides garden-style weddings and other social celebrations. Clearwater has excellent venues to choose from depending on the number of guests and style a client has in mind. And because of the relaxing ambiance it offers, not to mention to the charm of its man-made beach with fine white sand, the hotel is also the perfect venue for hawaiian themed birthdays and parties. 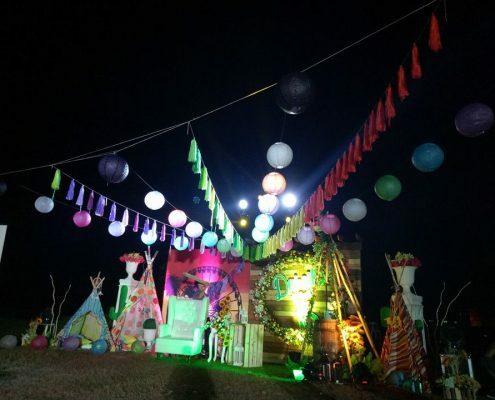 Last April 22, 2017, Miss Danika Florentino celebrated her 18th birthday in Clearwater Resort Clark Pampanga with a “Luau” themed party (hawaiian party). Every girl looks forward to her debut, because as they say, its a girl’s coming of age as she enters adulthood. Miss Danika and her family planned the momentous occasion months in advance selecting the most ideal venue, catering package and event planner. Miss Danika chose the hotel as the perfect venue for her debut as Clearwater offers a wide area along the Discovery Cove fit for her guests and family plus the “best” hawaiian feel it brings to guests. Her debut was highlighed by the traditional 18 roses, 18 candles and 18 treasures joined by her family, relatives and friends close to her heart. It was the perfect party she wished for. The Resort’s Discovery Cove Area is one of the largest event venuesin the resort accommodating comfortably over 1000 persons. It is situated by the beach and its surrounding swim spots, nestled between the clusters of the lakeside lodges and villas, this venue is very ideal for parties, weddings, big corporate teambuilding events and concerts. 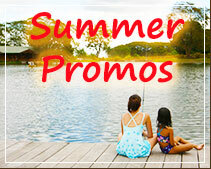 http://www.clearwaterphilippines.com/resort/wp-content/uploads/2016/11/Clearwater-Logo-WBG.png 0 0 clearwater http://www.clearwaterphilippines.com/resort/wp-content/uploads/2016/11/Clearwater-Logo-WBG.png clearwater2018-12-04 01:09:462018-12-04 01:09:46Miss Danika Florentino 18th Birthday in ClearWater Resort Pampanga!! Victory Christian Fellowship of the Philippines, Inc. (VCF) Me and My Dad Camping at ClearWater Resort! Victory Christian Fellowship of the Philippines, Inc. Victory Christian Fellowship of the Philippines, Inc. (VCF) is an evangelical church based here in the Philippines. VCF is now composed of thousands of students, professionals, and families. The church equips discipleship group leaders who meet weekly in coffee shops, homes, and offices for Bible study, prayer meetings and fellowship. They have 19 branches in Metro Manila and 10 in the provinces. 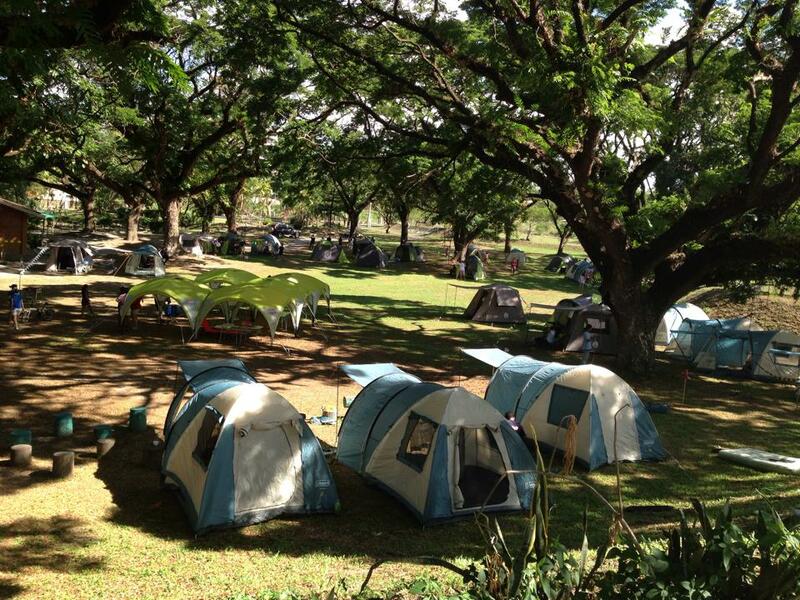 VCF has been a regular client of Clearwater Resort Clark Pampanga for their “Me and My Dad Camping” activity. 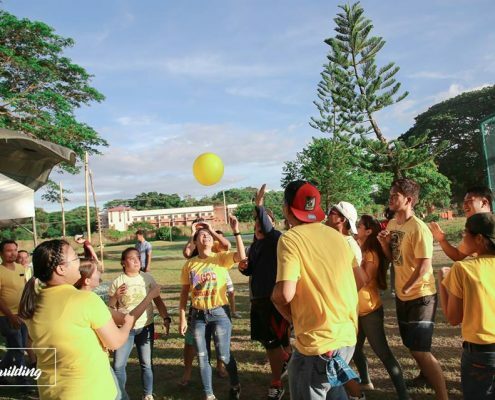 Every summer, the KIDS church, the KIDS Ministry of VCF organizes summer activities for kids to train them to be the next leaders to honor GOD and make disciples through fun activities. Their “Me and My Dad Camp” is a special two-day outdoor camping activity for fathers and their kids aged 6-11 years old. Thrilling games, enjoyable bonding activities and memorable Bible lessons await the participants of the summer camp. 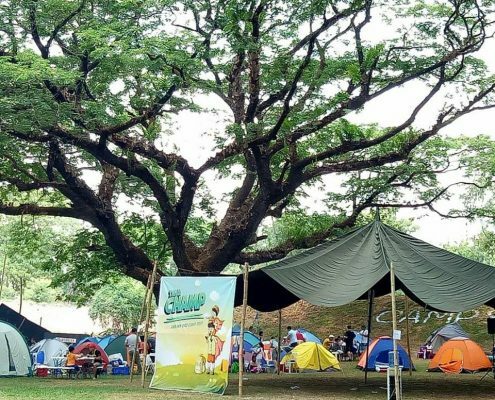 Last April 21-22, 2017, a group of almost 240 participants had their camping in the resort. The Brunello Gardens served as their venue for their camp. This venue can accommodate up to 1000 pax comfortably, and is often used for corporate teambuildings, group campings, concerts, weddings and other social events. The large acacia trees which surround the venue offer shade to guests and add to the charm of this venue. Some of the organizers and volunteers also stayed at the Family Inn Cabins. The Family Inn Cabins are a cluster of five spacious rooms located near the Brunello Gardens venue. These rooms are popular among family visitors preferrring peace and quiet stay. A few minute walk would lead the guests to the man-made lake and family cove lagoon. http://www.clearwaterphilippines.com/resort/wp-content/uploads/2016/11/Clearwater-Logo-WBG.png 0 0 clearwater http://www.clearwaterphilippines.com/resort/wp-content/uploads/2016/11/Clearwater-Logo-WBG.png clearwater2018-11-28 10:16:422018-11-28 10:16:42Victory Christian Fellowship of the Philippines, Inc. (VCF) Me and My Dad Camping at ClearWater Resort! Bloomingfields Academy Foundation, Inc. is a private school located in Arayat Pampanga which offers kindergarten, elementary, junior and senior high school education. They had their day tour school outing last March 27, 2018 in Clearwater Resort Clark Pampanga. 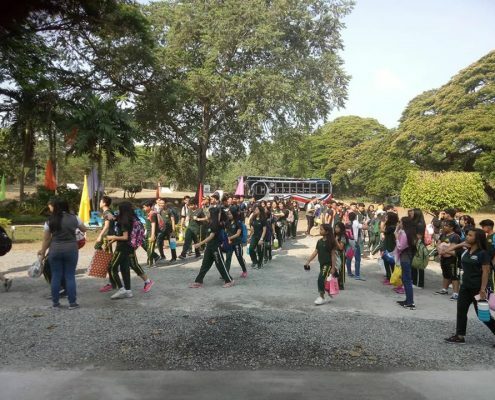 It was attended around 140 participants composed of by students, teachers and administrative personnel’s of the school. 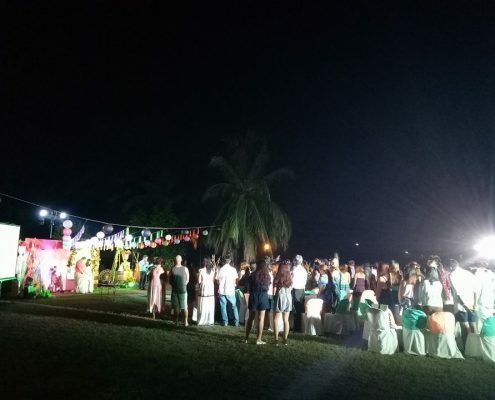 Because of the resort’s proximity from the school, the organizers chose Clearwater as their venue not to mention the resort’s facilities, food, sense of privacy it offers and the spacious venues as well as the exclusivity of the resort. Clearwater Resort is one of the few private resorts located near Manila, that offers a vast variety of venues suitable for groups of 50 pax to 5,000 pax. With the hotel’s 13 hectares of clean and safe space, Clearwater is generally regarded as the best choice of event venues for outdoor events and functions. 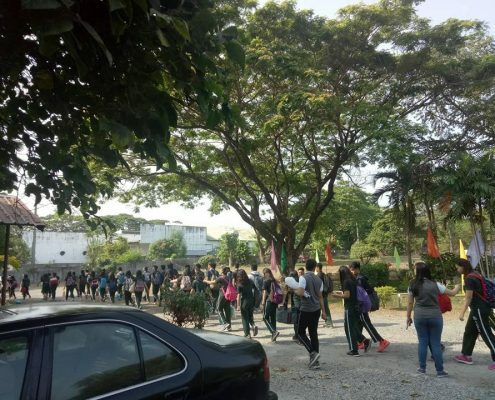 As soon as the students and other participants arrived in the resort, the smile on their faces proved that the resort is indeed the venue they are expecting. The Peninsula served as their venue which is adjacent to the family cove swimming pool, amphitheater and the famous Clearwater Lake. This venue can accommodate 100-120 pax and even more than that by incorporating adjacent venues. 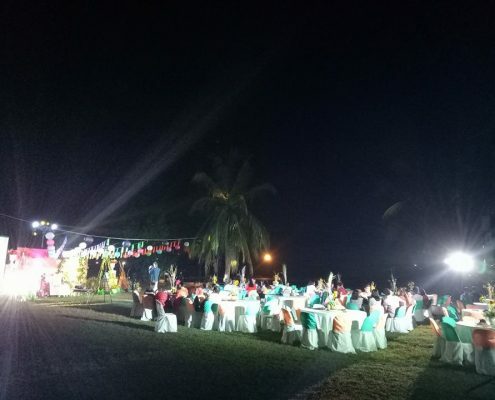 The group had fun activities and as expected, everyone enjoyed their event and was very satisfied with the venue, accommodating and courteous staff and relaxing ambiance of the resort. 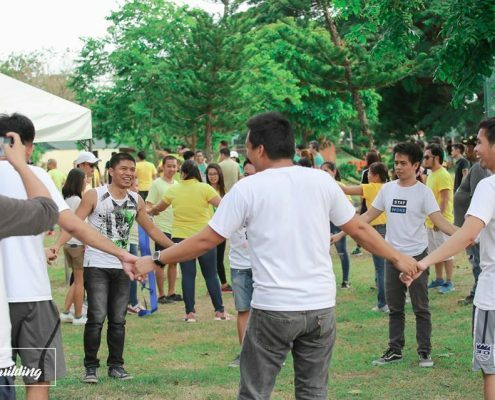 What kind of venues does most event organizers hope to find for a company teambuilding near Manila? One that is not too far from Manila for sure, within 1 to 2 hours. That’s the event destination. As for a venue in that destination, event planners require privacy and exclusivity, no potential disturbances from other guests in that vicinity. A controlled environment is not just desirable but very essential for the success of any corporate teambuilding event outside Manila. 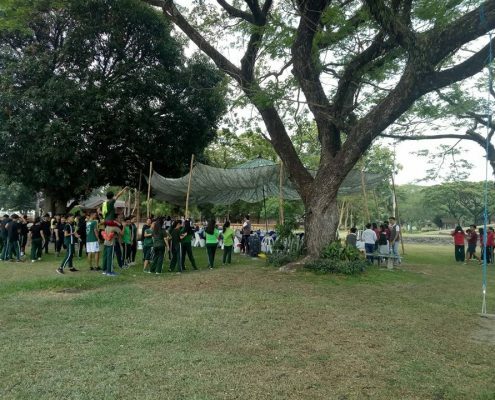 Click here for more information on private and exclusive event venues for team building in Pampanga, Clark Freeport ………. HBA DESIGNS (Hirsh Bedner Associates) Team Building at ClearWater Resort! Team bonding activities improve workplace projects that basically requires team effort. This is one way of understanding employees’ strength, weaknesses and interests that lead to good results like working even better together on future projects attributable to the company’s success. HBA DESIGNS (Hirsh Bedner Associates), a hospitality design firm which creates the signature look of today’s luxury hotels, resorts, spas, casinos, restaurants, cruise ships, botique hotels and world-class residence. They are well known for their extensive knowledge in the interior design industry. They have a branch in Clark Pampanga located in Philexcel and one in Taguig. HBA Clark branch conducted their teambuilding in Clearwater Resort Clarkfield Pampanga last May 4-5, 2018 and was attended by almost 260 participants. 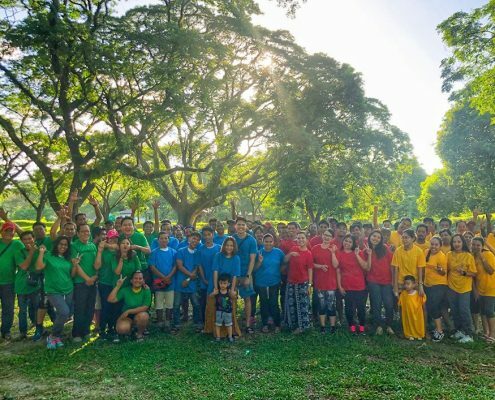 They aim to improve their employees’ wellness and productivity in the company and at the same time motivate them to work together for better projects. They divided the group into six (6) color coordinated teams and competed with each other on physical games and challenges. Well, in the end, they have learned the value of sportsmanship, cooperation and team effort. 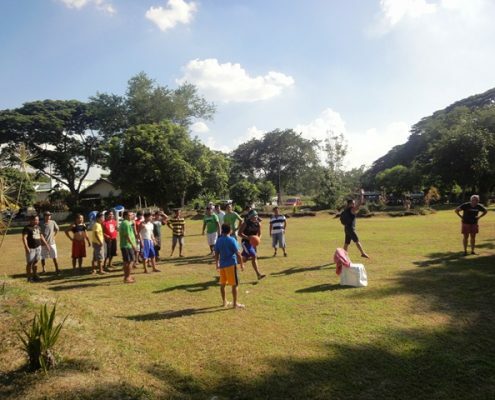 The Peninsula picnic ground served as their outdoor venue for their teambuilding games and activities. The Peninsula is a very popular venue for all sorts of events particularly school picnics, teambuildings and company outings. This venue is located between the Amphitheatre and the Frolic Gardens. The full view of the famous man-made lake of the hotel is enjoyed by the guests as well as access to the Family Cove wading pool. The Peninsula can accommodate groups from 50 to 300 pax if we include the Amphitheatre. Overnight accommodations nearest to the Peninsula are the lakeside lodges, bayou cottage, and bunk cottages. http://www.clearwaterphilippines.com/resort/wp-content/uploads/2016/11/Clearwater-Logo-WBG.png 0 0 clearwater http://www.clearwaterphilippines.com/resort/wp-content/uploads/2016/11/Clearwater-Logo-WBG.png clearwater2018-11-22 01:32:072018-11-27 02:21:51HBA DESIGNS (Hirsh Bedner Associates) Team Building at ClearWater Resort! 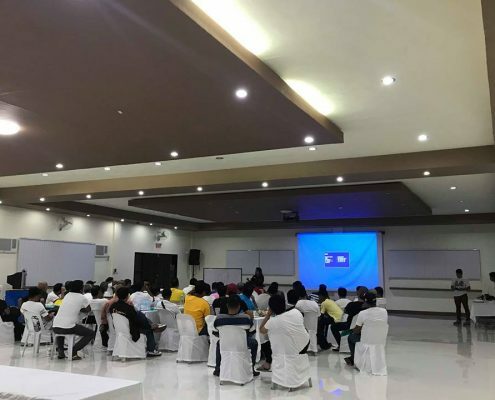 Last November 10-11, 2018, GENESIS Transport Service Inc. had their teambuilding and seminar in Clearwater Resort Clark Pampanga. Genesis Transport is a provincial bus company in the Philippines operating routes connecting Metro Manila to Central Luzon and Northern Luzon. Their bus service is highly recommended because of their courteous staff, wifi accessibility, clean buses and punctuality. The event was participated by around 80 pax employees including bus drivers, staff and conductors. This is the 9th batch of GENESIS Transport and all of their teambuildings and seminars were held in the hotel. They had learning sessions during the day and some ice breaker activities in between. 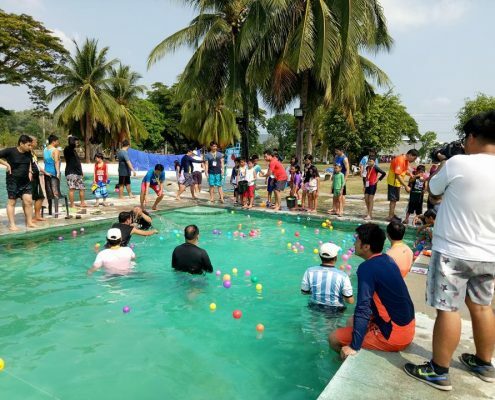 The staff were able to spend quality time with each other after the sessions and enjoyed the resort’s swimming amenities and other recreational facilities like boats, kayaks and even basketball. Their venue was the newly-built Discovery Hall of the resort equipped with high end quality PA system and high definition projector. The Discovery Hall is located at the Discovery Area of the hotel which is very accessible from the main entrance of Clearwater Resort. It is the most suggested indoor venue for big groups approximately 300-350 pax depending on the required seating arrangement and set-up requiring fully air-conditioned conference hall. It can be used for teambuilding, seminars, workshops, trainings and even social functions like birthdays and weddings. Should companies need an additional outdoor venue for some activities after their seminar or workshop, the Discovery Cove and Discovery Island are the best venues. Some room accommodations of the hotel which are also strategically located near the Discovery Hall are the patio cottages, executive villas, lakehouse cabins, Deluxe Twin and a few maters away are the lakeside lodges. Clark Freeport in Pampanga Philippines is particularly attractive to Manila companies looking for an event venue near Manila to hold teambuilding and company outings. Most out-of-town event destinations are either too far and takes too long to get there from Manila or the journey there is thwart with danger. Experienced event organizers know all too well that the single biggest concern for any teambuilding planner is safety. And there has been far too many serious accidents not in the venue but on the way to and back from the event destination. Perhaps this is one of the reasons why many companies have chosen to hold their team building events in a good resort hotel in Pampanga Clark Freeport. Tenman Project Management is a market leader in the management of gaming and hospitality projects in Asia, and has delivered some of the region’s most iconic and challenging projects. Their project teams focus on development management, project management, design, building services, IT/gaming systems and commercial management. Their branch in Clark Freeport Zone, Pampanga is one of the major development management team engaged in the expansion phase of Widus Hotel and Casino complex. 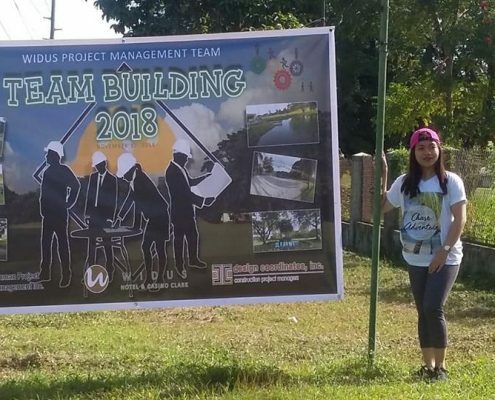 They recently had their team building last November 17-18, 2018 in Clearwater Resort Clark Pampanga and was joined by the Widus Project Management Team and Design Coordinates, Inc. The group was composed of 70 participants coming from the three (3) teams. It was a fun and challenging conference theme to inspire teamwork among themselves. There was a short discussion during the first part of the event and some challenging but still fun-filled activities thereafter. With the time constraint and accessibility purposes, they chose the resort as their venue for the event as this will save cost and will allow them to spend more time in the destination rather in the road. 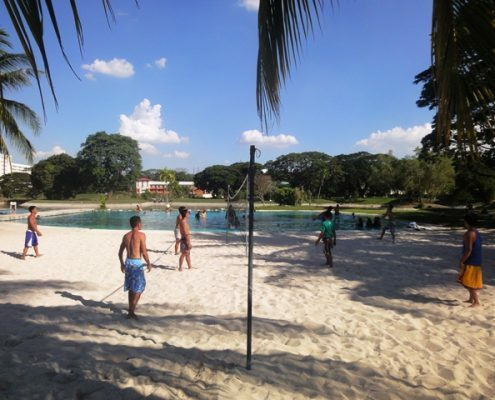 Clearwater Resort is a highly recommended place of event organizers and even facilitators for team building, friends or group bonding and even social functions. As they say, the hotel will surely connect you with nature, a venue that is exceptional and very relaxing. The discovery hall of the hotel served as the venue for the Tenman’s team building event. This venue is perfect for big groups requiring indoor function room which can comfortably accommodate 200-350 pax. 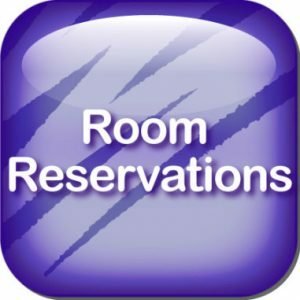 Suggested room accommodations for overnight stay are the Patio Cottages, Lakehouse Cabins, Executive Villa and Deluxe Twin. Quite near the location are the eight (8) lakeside lodges which is located within 5 minutes walk from the discovery hall. It comes as no surprise that Clearwater Resort is one of the preferred venues for corporate and social events near Manila. 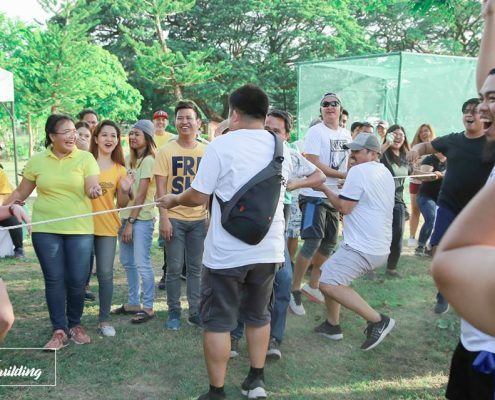 Some teambuilding facilitators said that Pampanga Clark Freeport’s proximity to Manila is a major advantage for this report in Clark because this enables event planners to complete the event within a day, avoiding the extra costs of overnight accommodation. Other corporate event planners cite safety and security, or law and order, as a big plus for this resort in Clark, commenting that nothing ruins an event faster than some accidents or unwelcome incidents not only during the event but also en route to the event destination and returning home from it. Last Nov 10-11, 2018, Builders Exponent Enterprises, a construction materials supplier which holds business in Orani Bataan, recently held their team building in Clearwater Resort Clark Pampanga. The event was participated by around 80 people from their top level management, staff and sales team of the company and some even brought their kids. They hold their team building to build a more effective team, breakdown personal barriers, eliminate stress and the most important of all, is to relax and have FUN! 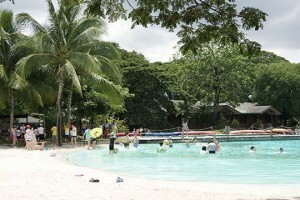 Clearwater Resort is one of the few private resorts near Manila that offers variety of venues suitable for small groups of 50 persons to big groups of 5,000 people. This hotel in Clark Pampanga is the best choice for event venues both for outdoor and indoor functions. The group played their games and activities at the Brunello Gardens of the resort. The Brunello Gardens is a versatile event venue that accommodates up to 1,000 people. This is often used for corporate team buildings, group camping, concerts, weddings and social events. Large acacia trees surround the venue and offer shade from the sun during the day and leaves a very charming ambiance during the night. 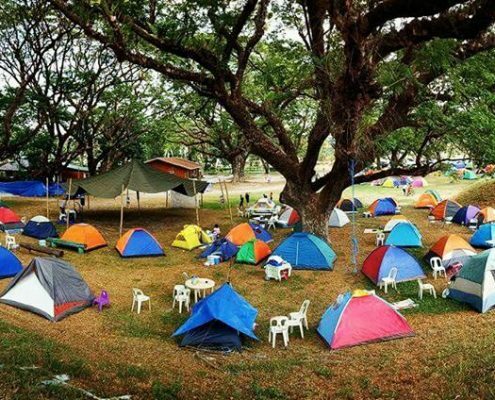 Looking for a good and safe place to go camping near Manila? Check out Clearwater Resort which offers camping grounds and plenty of outdoor facilities for glamping near Manila. Camping in style, that’s what glamping in the Philippines is all about. Roughing it is a thing of the past for camping in the Philippines. Bring the family up to Clark, just a mere 70 minutes drive along NLEX up from Manila, to relax and unwind in the natural outdoor facilities of this resort in Clark Pampanga. And yes, there are cottages, cabins and lodges in this resort also. 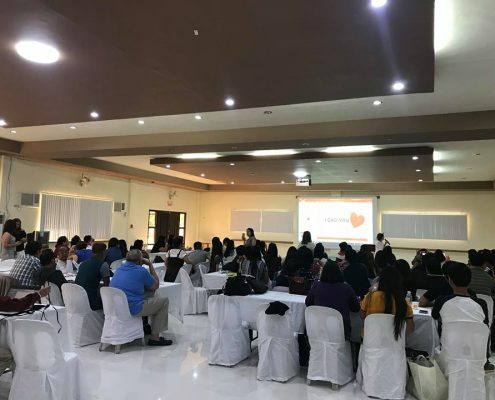 Philippines Department of Education (DEPED) Region 3 Division of Olongapo City recently conducted their “Gender and Development Seminar” in a nature Resort inside Clark Freeport of Pampanga. The event was organized by White Dove Travel, a well known event organizer and travel agency in Pampanga. 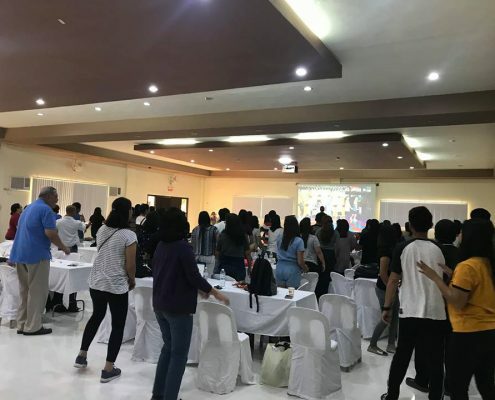 Over 100 participants composed of teachers and staff from major schools in Olongapo City participated in this teambuilding event in Clark Philippines. The newly built Discovery Hall of Clark’s Clearwater resort served as their venue for their seminar. The event went on very smoothly with their properly coordinated programme and well organized activities. 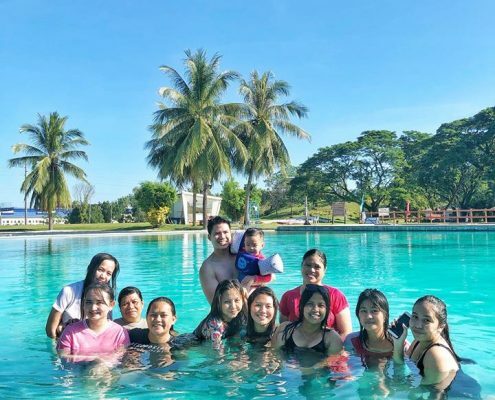 After the whole day seminar, they also had the chance to experience the relaxing feel and ambiance of the hotel as they enjoyed their free time late in the afternoon, soaking in the leisure lifestyle and natural ambiance of this resort in Clark Pampanga. It was a wonderful experience for all the participants as they were able to hold their seminar and relax at the same time. This was evidenced by the comment of the organizer “KUDOS! To all the staff who made the seminar of my client beyond expectations!”. Clearwater Resort expressed their gratitude for all the participants who visit this resort hotel in Clark Pampanga. It was a wonderful experience for all the participants as they were able to hold their seminar and relax at the same time. This was evidenced by the comment of the organizer “KUDOS! To all the staff who made the seminar of my client beyond expectations!”. Pampanga Clark Freeport’s proximity to Manila enables event planners to organize day tours. Instead of staying overnight, the overall cost of the team building event can be reduced. Some of the savings can be channeled into improvements in other aspects of the event, better food for example. This is just one of the many reasons why teambuilding facilitators and corporate event organizers choose a resort in Clark Pampanga as their event venue. P & B Valises Et Compagnie, Inc. is well known for re-interpreting and improvising its furniture and pieces through classical designs. They hold office in San Fernando Pampanga. The company manufactures, fabricates, and markets an electric line of residential and hospitality contract furnishings. Some of their product line includes baskets and storage, candles and candleholders, chest/lockers, decorative panels, desk accessories, indoor furniture, mirror and mirror frames, seasonal candles and candleholders and table tops. Their products are usually made of leather, rattan and wood. They had their day tour teambuiding in Clearwater Resort in Clark Pampanga last May 16, 2015. The 108 participants who attended the event included all staff and higher management. 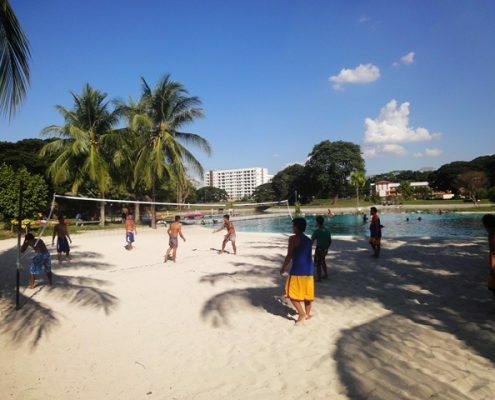 While in this resort in Clark, the team building involved several outdoor activities such as beach volleyball, basketball and sack race. the teambuilding facilitator also added some mind games as well to foster team spirits. 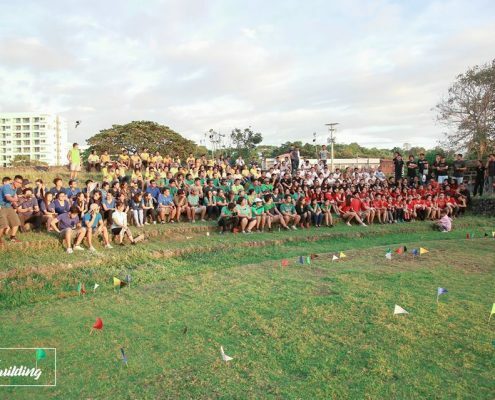 The participants relished the outdoor facilities and vast grounds of this resort in Clark. It as in the frolic garden of this resort in Pampanga where they bonded, enjoyed some laughter while cheering their team mates on in their outdoor activities of this resort. It was truly a fun filled day worth remembering for this group. The Frolic Gardens of the resort exudes the kind of relaxing ambiance that make it possible for guests to relax and unwind. It can accommodate groups of 100 to 300 people. And for those who wish to stay overnight for their event, the lakehouse cabins and bunk cottages are highly suggested because of the proximity of these rooms to the venue. 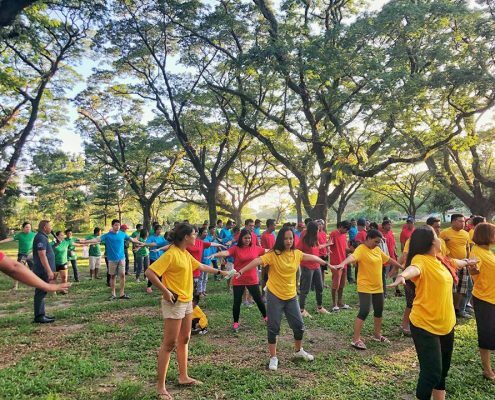 The leisure ambiance and feel of nature in this resort in Clark have long been regarded by facilitators and event organizers as an essential factor in achieving good results in teambuildiing exercises. The hotel facilities, good food, the sense of privacy of different spacious outdoor venues are factors that event organizers can use to their advantage. 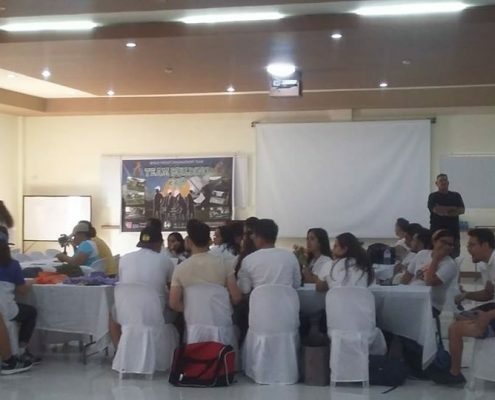 The DILG Killed in Action/Wounded in Action-Project Management Office conducted their “Regional Working Group Cascading Session” in Clearwater Resort on September 26-27, 2018. On the 1st day of the event, only the organizers stayed overnight in preparation for the event. The actual planning session was scheduled on Day. The group was composed of 190 participants coming from different DILG affiliated government agencies. 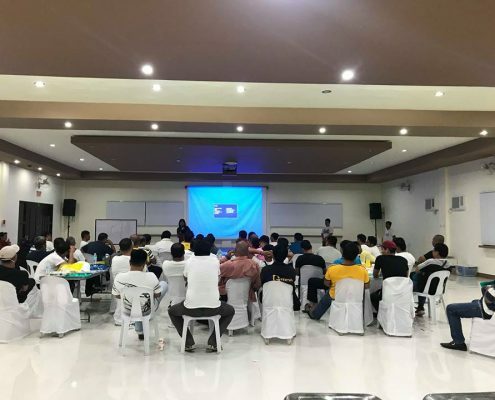 They were able to comfortably conduct their planning session in Clearwater’s newly built Discovery Hall which is strategically located at the main entrance of the resort. The Discovery Hall is very ideal for seminars, training, workshops and other indoor activities like wedding receptions good for 200-300 pax depending on the client’s set-up requirements. Considering that the majority of the participants came from the Region III, Clark Pampanga is the best and preferred venue for the group. Clark Freeport in Pampanga Philippines is well regarded as one of the best event destinations near Manila. Not only is the journey there a mere 70 minutes, short enough for a same-day return day-tour, it is all driving on highways – NLEX connecting to SCTex exiting straight into the heart of Clark Pampanga. The quality of the journey not only contributes to the comfort of the participants of a teambuilding event, but also greatly reduces the risk of road accidents to and from the corporate event destination. This is just another reason why more and more Manila companies have decided to hold their team building events in a good resort hotel in Pampanga Clark Freeport.